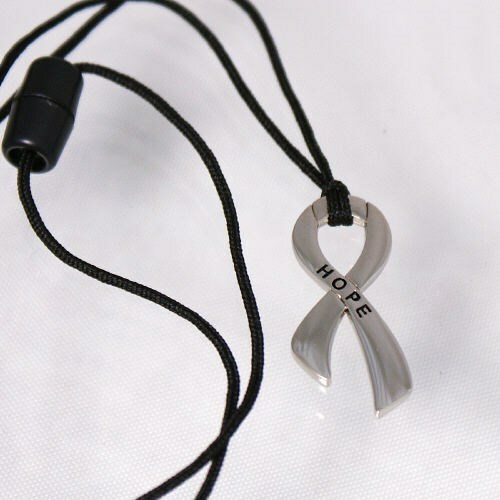 Give this meaningful Hope Ribbon Necklace to someone who needs to know that faith, hope, and love will get her through this tough time in her life. Our beautiful Hope Necklace is a perfect way to extend the arms of comfort, sympathy and encouragement to a special woman needing strength. Our Stainless Steel Ribbon Necklace measures .5" x 1 1/4" with a nylon cord necklace up to 20". Today’s Price: $5.99 In Stock! Nice necklace that makes a great gift for a struggling friend especially. There's Hope for Breast Cancer. Find inspirational Personalized Breast Cancer Gifts such as Personalized Breast Cancer Jewelry, Breast Cancer Apparel and other accessories.